The most exhilarating part of travel is the human connections we make. The unique, intimate experiences where you go off the beaten track and are invited to experience life as a local. Truffle hunting with a fifth generation truffle hunter; being invited in for aperitif in a 15th century home turned artists atelier; the simple pleasure of dining in a locals-only bistro (what the French call their ‘cantine’); to playing a game of petanque and sipping pastis as the sun sets. Our most recent creative retreat was a Winter Gathering called ‘Forage Feast Photography’. Five unforgettable days created around foraging for winter truffles, cooking, food styling and photography. Led by mentors from across Europe including celebrated food photographers and writers Aimee Twigger and Valeria Necchio coupled with Parisian floral designer Elodie Love, filmmaker Nora Jaccaud and Venetian chef Giuseppina Mabilia. My goal was to not only create beauty, but to create something about heart, about community, coming together to cook and nourish one another. Imperfections celebrated and risks taken. Our next creative retreat is ‘Summer Gathering: Forage + Feast + Photography’ , 3-7 July 2019 in Saignon, Provence. …. exclusively small groups of maximum 6 guests with an itinerary crafted on the interests and passions of my guests. I believe the ultimate luxury is having someone not only taking care of all the details and finding niche experiences but also being there personally to guide and act as the conduit. I really believe that to get to the beating heart of Provence – you must explore the beautiful villages and towns through its people. I always carefully select and plan a visit with a very special artist in their home or atelier space. It could be a ceramicist, a painter, a plumassiere, a textile artist or a photographer – the fun is in creating chemistry between artist and guests. For those craving a special antique textile or looking to source something for their home – I’ll call up my favourite antiques dealers and we’ll have a private buying appointment in their home. 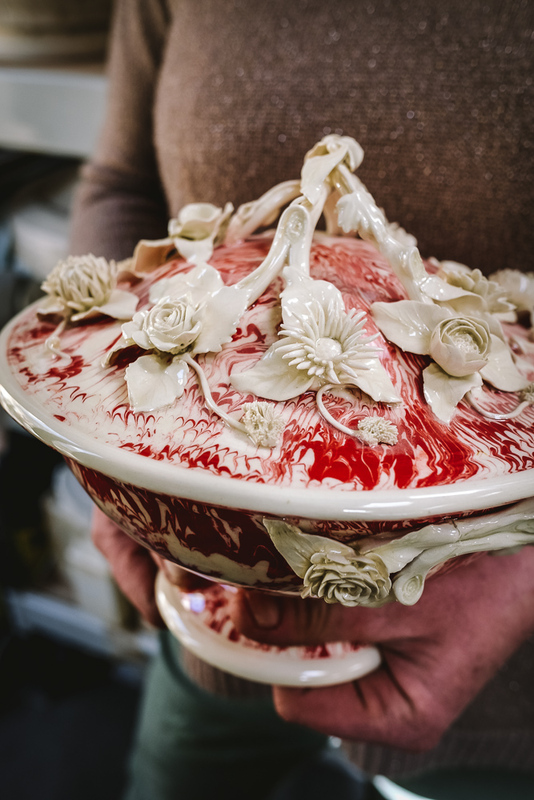 We visit what I like to call ‘anti-museums’ – the homes and personal collections of passionate collectors where we can get up, close and personal with beautiful objets d’art and witness first hand how to live and decorate with antiques, textiles and art. We taste our way through my favourite off the beaten track villages on market day and I often organise an intimate cooking class with a wonderful chef who creates simple, clean dishes using only the freshest of seasonal ingredients. I take care of all the meals and create a mix of classic French restaurants, luxury picnics and charming foodie gatherings and tastings in makers homes & ateliers, and wonderful home cooked meals at the French Muse bastide. … and distilling the true essence of Provence is ultimately what I aim to do at every French Muse experience. Taking guests deeper into the heart of Provence, beyond the shallow tourist traps to create transformative interactions – sustenance in all senses of the word. Every day lived in Provence is a day of beauty, filled with tantalising flavours and enduring inspiration – why not let us share it with you in 2019! Limited Places left for 2019. 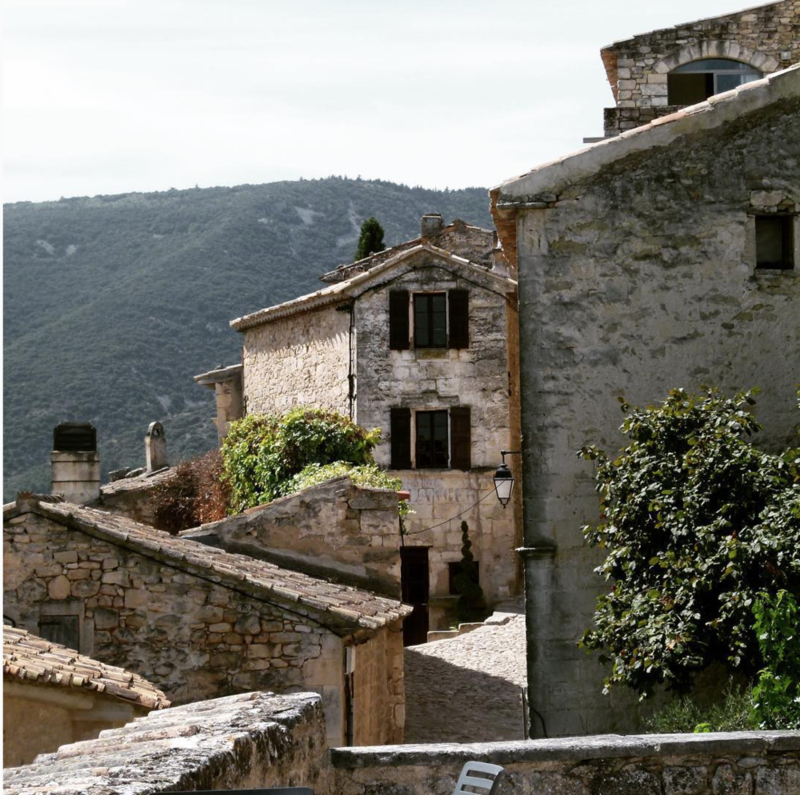 Experience Provence like an insider "off the beaten track" in our favourite villages, tiny hamlets and artists' enclaves. 7 Nights All Inclusive Retreat, a true Insider experience with exclusive access to artists homes & ateliers, culinary feasts & tastings and soaking up history at our favourite French brocantes. Where: Gordes, one of the most beautiful villages in France. 40 mins from Avignon, 1 hr 15 mins from Marseille and only 25 mins from Isle sur la Sorgue. *Contact me if you wish to share a room with a friend as we have a twin room option. All rooms share a bathroom (with one other guest). October 8-15 2019: Now open for bookings. We have two French Muse homes, which have been carefully chosen for their charm, warm interior design and comfort. For smaller groups (4-6 guests) your home away from home will be in a recently restored village home, in the hilltop village of Lacoste in the Luberon, one of the small villages which inspired Peter Mayle in his book, A Year in Provence. Within walking distance of the castle of the Marquis de Sade, the rooms and terraces offer breathtaking views of the mountains of the Vaucluse and the valley that sweeps down towards nearby famous villages Bonnieux and Goult. For larger groups (8-10) we have a wonderful ancient 12th Century home in the countryside of Gordes which is filled with artwork, books and heart. Our French Muse homes are not your run-of-the-mill rentals - they are family homes which are decorated with antiques and artwork, real Provençal homes. To experience Provence is to taste the sunshine and understand the meaning of ‘Terroir’! When you come on the French Muse Experience, all your meals are included; a traditional French breakfast, lunch and dinner. We include a perfect mix of our favourite classic French restaurants, luxury picnics and charming foodie gatherings planned in makers homes & ateliers, and wonderful home cooked meals at the French Muse house/bastide. We’ve even been known to host cheese & champagne pyjama parties at the end of a long exciting day out!. We are so excited to share what we feel is a very unique and personal itinerary. How better to discover the heritage, history and heart of Provence than to spend a morning exploring the French flea market. We can’t wait to introduce you to our favourite artists including potters, textile artists, collectors, printmakers, photographers, sculptors and painters; who will generously open up their beautiful homes, ateliers and personal collections. With many years experience in French antiquing, The French Muse opens its little black books of private antiques dealers and creates exclusive antique textile and brocante sales outside of the flea market circuit. ….and plenty of time in between to become inspired anew & connect—with others, yourself, and the world around you. 7 nights accommodation with shared bathroom. All of your meals, delicious fresh French breakfast every morning and seven lunches and dinners. We will do a mix of our favourite restaurants in the area, luxury (catered & styled) picnics, special gatherings in makers homes/ateliers and catered meals. Refreshments during meals (wine etc) are of course included. A very unique and personalised itinerary based on my extensive local knowledge of brocantes, the creative community and life in Provence. We very much take into account your interests and passions and will ensure you get to the markets / private dealers that fit your personal profile and needs. My services as a local bilingual guide for all brocantes, flea markets and planned activities. Access to private sales and my favourite consignment shops. Orientation to our favourite Provencal markets. Private tours of internationally renowned appointment-only artists ateliers. Guidance and access to ‘off-the-beaten track’ antique stores and private brocante in dealers homes. When you sign up for your French Muse experience week, a non-refundable €1000 euro deposit will hold your booking for this particular date. The remaining payment can be made in one or two instalments. If you wish to pay in two instalments, we request that the first instalment is paid six months prior to retreat and remaining instalment paid 3 months prior to retreat. Payment is accepted either by International bank transfer. If you wish to pay via credit card i.e. PayPal then there is a 3.5% Convenience Fee applied. P.s. If you plan on travelling with a room-mate, then please simply let us know when you book your retreat. We must request that you approve your travel plans with us in advance of booking any tickets (flight or train). We are very open to helping you find the easiest route to our retreat but it is essential that we know your planned arrival and departure times before booking. This is simply so that we can ensure all of our guests arrive in time for us to make a general airport transfer from Marseille airport on the afternoon of the arrivals day. Return airport transfers are made the following Tuesday morning, to Marseille airport. If for some reason you must cancel your trip to France for The French Muse Experience, please remember that a full refund (deposit is non-refundable) can only be provided if notice of cancellation is provided six months before retreat date. After this date, if you cancel your place, you will forfeit your payment. Please don’t hesistate to ask us anything if you are unclear about our booking and cancellation policies. On registration for The French Muse experience you will receive an initial email confirmation note. Two months prior to the retreat we will send you further details and a questionnaire that will help us further create a week that will fit with your interests and passions. How many people can we accommodate at our retreats? Our retreats are limited currently to a maximum of 8 guests and may include a visiting artist or speaker depending on the specific retreat and/or workshop. Your home away from home will be in a recently restored village home in the hilltop village of Lacoste in the Luberon, one of the small villages which inspired Peter Mayle in his book, A Year in Provence. The French Muse home is within walking distance of the castle of the Marquis de Sade, the rooms are all ensuite. Two rooms have twin beds if you wish to share a bedroom (please get in touch to know double occupancy rate). Single occupancy means you will have a bedroom to yourself with a shared bathroom. Provence is very relaxed, combined with often hot weather mean that comfort is an absolute. A swimsuit, your accommodation has a pool and it can be so lovely to take a dip after a day in the sun! We would recommend bringing a scarf and/or cardigan for when the sun sets and we are eating outside. An oversized tote bag or backpack for storing your brocante and market finds. Think cotton. Dress for comfort and to stay cool. Walking shoes for days spent treasure truffling at brocantes and exploring the perched villages of Provence. Don’t hesistate to ask if you are concerned about what to bring! P.S. If you’ve forgotten to bring any of these essentials in your suitcase, don’t worry, we will be bringing you to local markets where we can source affordable French versions! P.P.S. Don’t forget to leave plenty of room for all the French gems you are going to want to bring home!